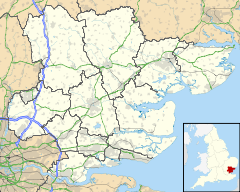 Stifford is a place in the unitary authority of Thurrock, Essex. The traditional parish of Stifford is divided by the A13 trunk road into two communities known respectively as North and South Stifford. The place name Stifford is first recorded in Domesday as Stiforda and means "path ford". The ford was across the Mardyke which flows through North Stifford before joining the Thames at Purfleet. Stifford gives its name to the Stifford Clays housing estate built in the late 1950s. South Stifford is a small residential area within the town of Grays. South Stifford separates Grays' town centre from West Thurrock and Lakeside Shopping Centre. It acts as a residential area for people working in many of the towns factories and surrounding retail areas, however it has recently been overshadowed by the huge housing estate of Chafford Hundred. South Stifford has one primary school, Stifford Primary School. This page was last edited on 9 November 2017, at 11:41 (UTC).